Local branding specialists and regular client, Torque Branding have announced a new range of motorsport themed apparel and accessories under the ‘Full Torque Gear‘ brand. As part of this announcement, the company will have branding on Alex Welch’s Porsche 911 GT3 Cup car in the Pirelli World Challenge. I was commissioned by Torque branding to produce a launch illustration which combined Alex’s existing livery (an ex-Parr Motorsport car) and car with Full Torque Gear’s coloration in full vector. This will also form the header for their to be launched website. I will be supplying Full Torque Branding with a small number of designs during the year. 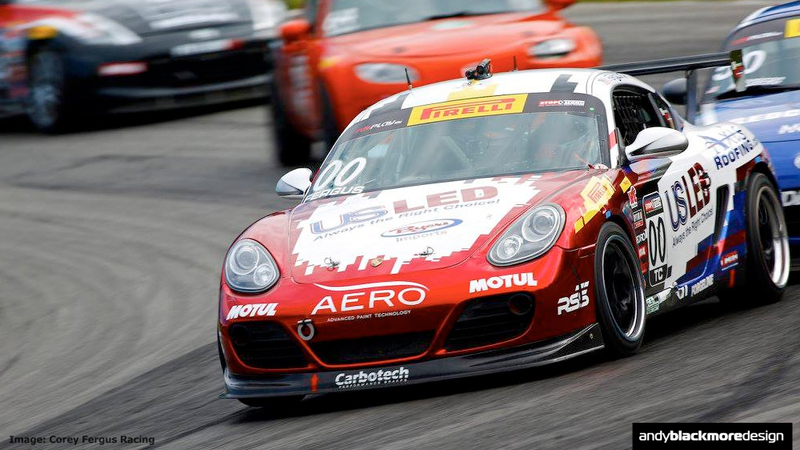 2015 Pirelli World Challenge ‘TC’ Champion, Corey Fergus will move up to the GT Cup class of the Pirelli series with an updated livery on his new racecar, a Porsche 991 GT3 Cup Car. 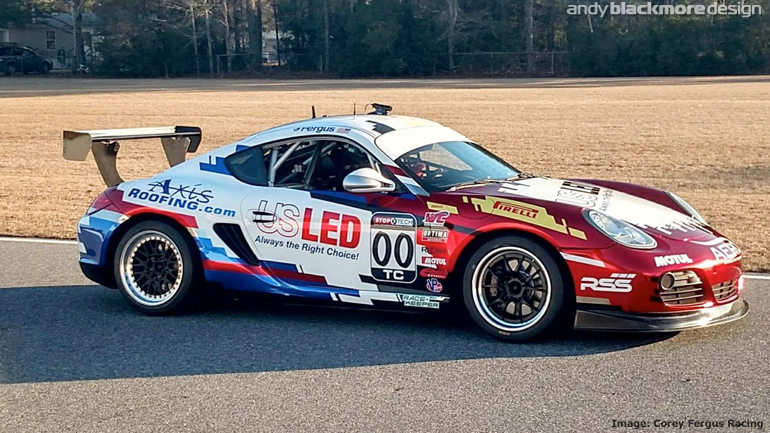 I designed the original AERO livery on his championship winning Porsche Cayman for the 2015 season from a joint commission by Corey and AERO paint films. The livery has proved successful and recognizable in the crowded PWC grid in 2015, so the best approach was to update it to fit on the new 997. Slightly different proportions and additional sponsor requirements resulted in an extensive rework on the side to ensure it was resolved on the longer wheelbase car. No cutting corners here. HPA Motorsports Inc. are a local VAG Specialist and are well known for their Volkswagen builds. They have previously won SEMA Sony Gran Turismo awards and the first people to bring the original VW Golf R32 and now the Scirocco to North America. 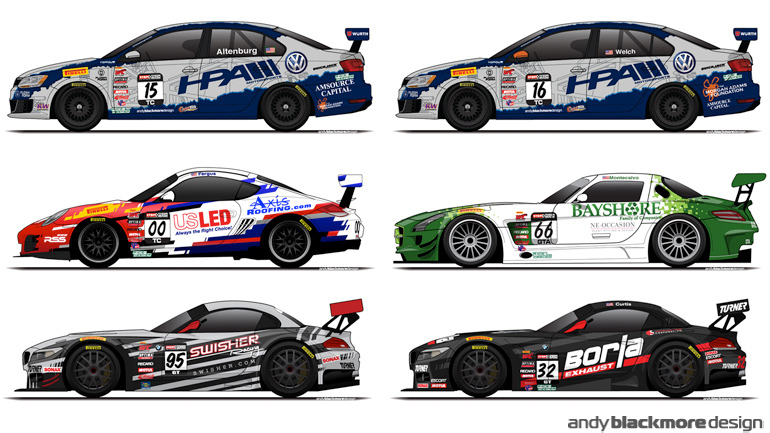 This year, they decided to enter the Pirelli World Challenge in the TC (touring) class. They only had a couple of months to get everything ready, built up, organise and structure a race team. Quite a tall order….oh and the also had to find someone to do design their team identity, if only there was someone less than 1km away…. Andy Blackmore Design will feature heavily in this weekend’s opening rounds of the Pirelli World Challenge event at The Circuit of The Americas. Six cars and five liveries will make their debut for Turner Motorsports, HPA Motorsports, Corey Fergus Racing and Bayshore Racing. 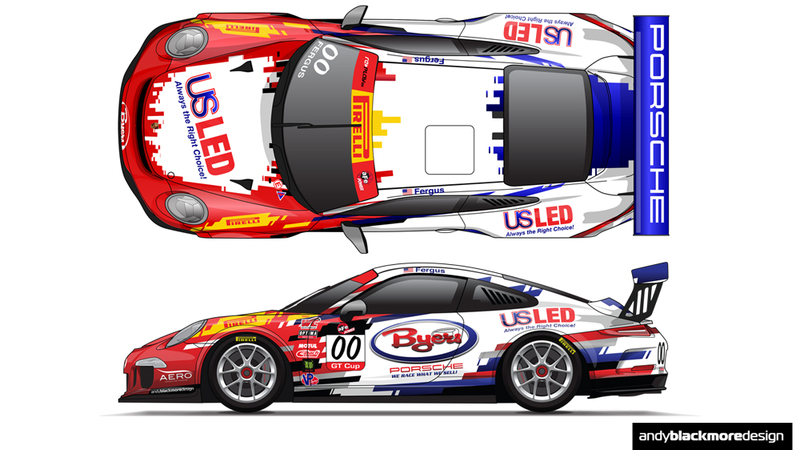 AERO paint films and Race driver, Corey Fergus, recently approached me to design a livery for his new Motorsports Promotion Porsche Cayman which he will compete in the the Pirelli World Challenge. With AERO as a partner, it was important to showcase the paint films which they create as well as supply other racers including Michael Shank Racing and my designs for CJ Wilson Mazda MX-5 (CTSC) and Tyler McQuarrie Racing’s Chevrolet Camaro (Formula Drift). 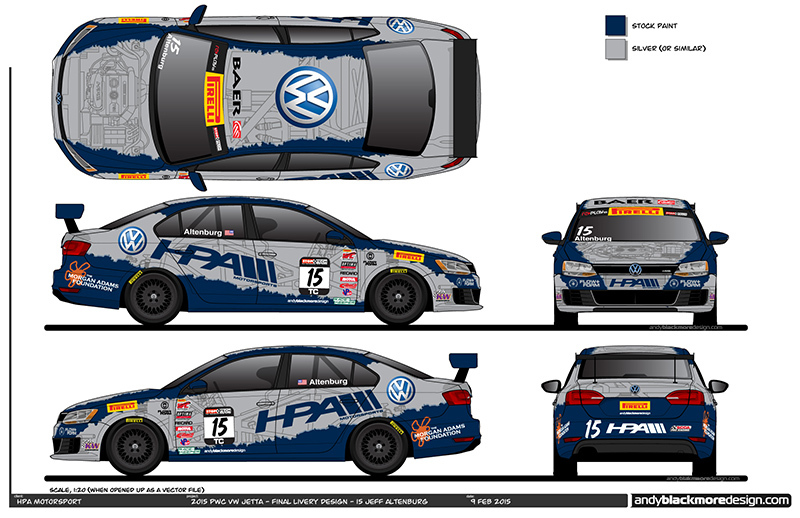 I have recently been working with a local team, HPA Motorsport, one of the leading Volkswagen Audi Specialist in North America on the creative identity of their two car ‘TC’ class team in the 2015 Pirelli World Challenge. 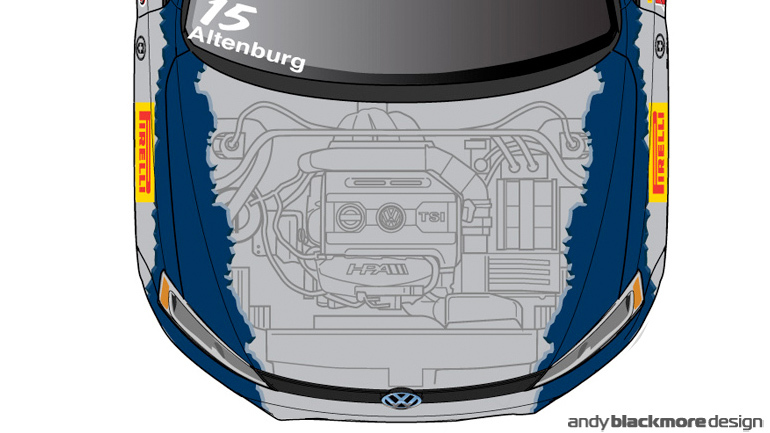 With a desire to showcase their automotive parts and cutting edge SEMA winning car builds, I have created a livery which showcases the parts of their their VW Jetta GLi race-cars via a tear-away cutaway graphic. With the team being so local, I’ve been able to measure up the car closely and take over 400 reference photos in order to draw up the livery. The design takes the form of a partial wrap with the original Metallic Blue paintwork surrounding the cutaway with a jagged graphic based loosely on their existing corporate identity. It has been great working with HPA on the design and I believe we have come up with a distinctive design. One of the more complicated and challenging liveries to creates,but nothing I like better. 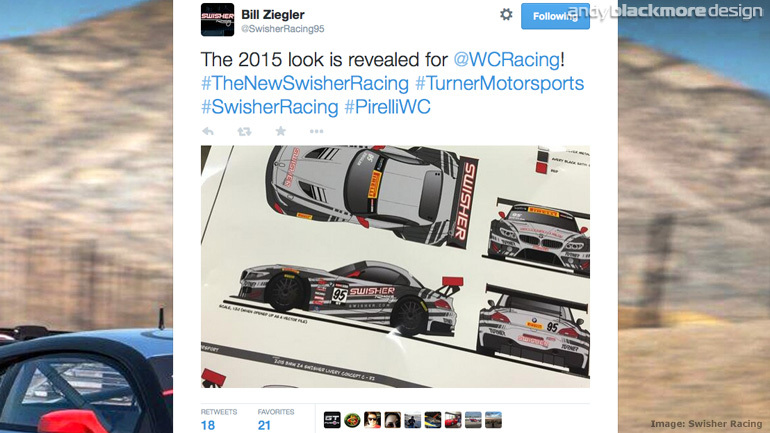 Pirelli World Challenge racer, Bill Ziegler and Swisher Racing posted a preview of their new livery on Twitter this past weekend. The Swisher Racing BMW Z4 GT3 will be prepared by Turner Motorsport and the new livery has been based off the Turner Blue and Yellow livery which I created last year. 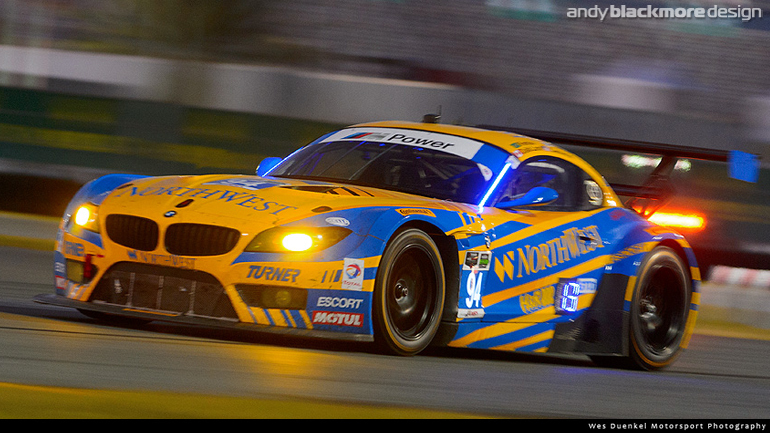 Turner Motorsport will be running two cars in the ‘PWC’ in addition to their TUDOR United SportsCar campaign. I had also previously worked with Swisher last year, assisting with bringing their livery idea to life and incorporating it into the GMG Racing team look (another livery I designed! ), the team who ran their Audi R8LMS Swisher Racing entry in 2014. Turner Motorsport have announced they will defend their GTD Class title in 2015, returning for a full season of the TUDOR United Sports Car Championship. 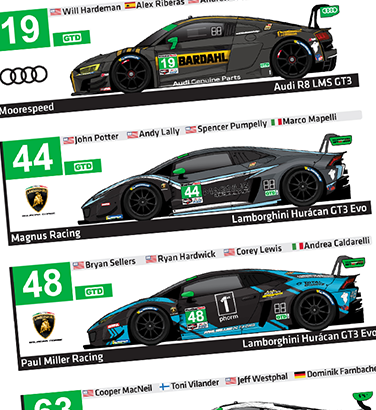 After a challenging debut in the series in 2014, the team bounced back to win the GTD Class Championship. Turner were the first team worldwide to win a major championship with the BMW Z4 GT3. 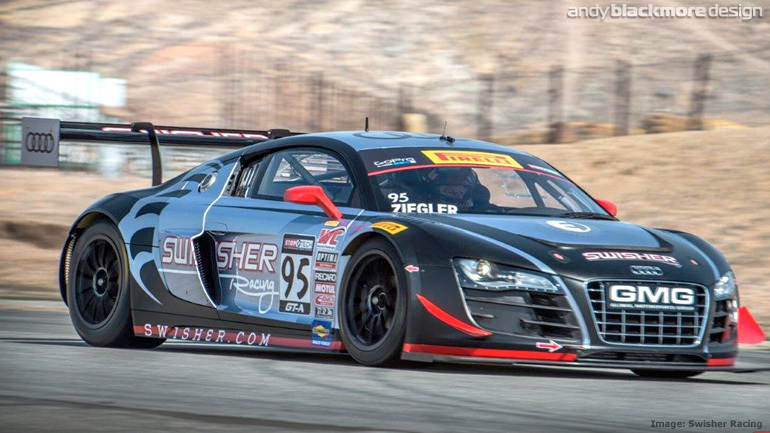 For 2015, Turner will compete in the TUDOR series and the Pirelli World Challenge. More news on the PWC program and liveries soon. My Portfolio showcases the design process behind the current Turner Motorsport Livery.